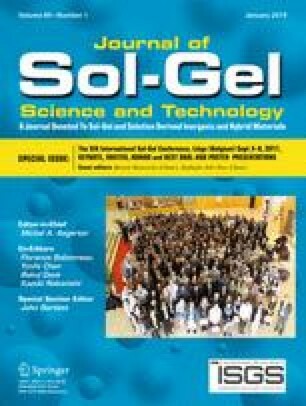 A thin film containing rhodamine B derivative with ethoxy silano group was formed on organic film substrate using the sol–gel method. Rhodamine B derivative with a triethoxysilano group, SiO2 sol and acrylic polymer having a triethoxy group were reacted in alcohol to give a coating solution for film formation, followed to be roll-coated on polyethylene terephthalate (PET) film and heat-treated at 130°C. This thin film consists of inorganic polymer (SiO2), organic polymer (acrylic resin) and organic dye. These component parts become interconnected through mutual chemical bonding. This thin film has an absorption peak at 578 nm and superb water resistant characteristics (almost no dye elution in 50°C water for 150 min) as a result of chemical bonding between the organic dye and the matrix skeleton. It also has good flexibility. The film can be used as a wavelength-selective absorption film for displays to improve contrast.